If you're going to face Dennis Orcollo in the late stages of a major 9-ball championship, you better leave any fear in your hotel room. With just 10 players of the original 406 remaining in the 9-ball division at this year's Derby City Classic, Taiwan's Ping-Chung Ko didn't wait long to show he wasn't afraid of much. The pair split the first two games in the race-to-7 on the main TV table in the Accu-Stats arena. After Ko's dry break, Orcollo opted to push out, placing the cue ball in the devious position shown in the diagram. The cue ball nestled near the point of the side pocket, so only a sliver of the 1 ball in the upper right corner could be seen. The obstructing 2, though, ensured any hit on the 1 would need to be thinly cut, limiting options for controlling either ball. Ko eventually opted to take the shot, instead of passing it back to Orcollo. He played an ingenious full-table bank on the 1 toward the 5 ball in the bottom right corner. Because the 5 was hanging inches from the pocket, Ko's margin for error was slightly increased. 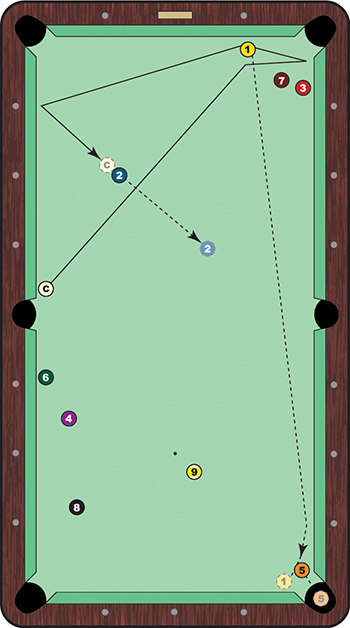 The 1 ball ambled down-table, ricocheting off the long rail and directly into the 5, which fell into the pocket. The cue ball, narrowly avoiding the top left corner pocket, went three rails and straight into the 2, giving Ko an angle on the 1 along the foot rail. Ko couldn't clear this table, however, and Orcollo pounced, running away with the set, 9-4. Finishing in seventh place, the 21-year-old rising star continues to make a name for himself. The younger brother of world No. 1 Ko Pin-Yi, he collected third-place finishes in last year's 9-ball and 10-ball world championships. It appears only to be a matter of time before his major breakthrough.